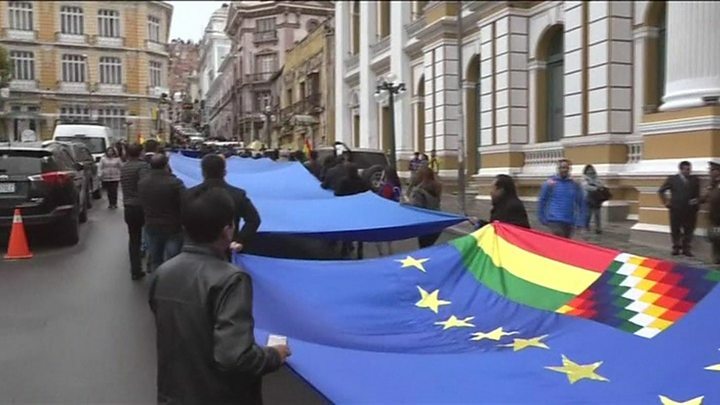 Bolivia has deployed an unusual weapon in a maritime dispute with Chile - a colossal flag stretching about 200 km (124 miles). Bolivia says that Chile has an obligation to "negotiate a sovereign access to the sea for Bolivia"
The Bolivian government said the flag is the world's biggest, and extended between the cities of La Paz and Oruro. Image caption Evo Morales, Bolivia's president, has called for "sea for Bolivia"
The current borders were agreed after the 1879-1884 War of the Pacific. The war, which pitted Chile against Bolivia and Peru followed attempts by Bolivia to tax a Chilean nitrate company in violation of a previous treaty. Chile despatched troops to the north in protest and within weeks the two sides were at war. Bolivian President Evo Morales said in October 2017 that Chile made a secret offer in 1975 to grant his country access to the Pacific Ocean through a 10km corridor. Speaking at the flag's unfurling he called it a "flag of maritime vindication". The Guinness World Records organisation said they had no plans to certify whether the flag was indeed the world's biggest. Correction 18 April 2018: This article has been amended to explain in more detail the causes of the War of the Pacific.